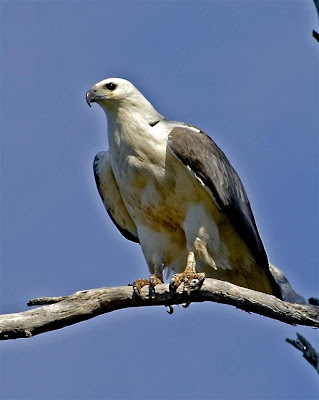 I don't wish to give the impression that I've seen too many Wedgetail Eagles of late. 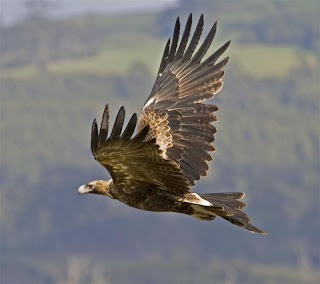 To misquote Samuel Johnson, "when a man is tired of watching eagles, he is tired of life". Perhaps in this PC age, I should have used the term "person"! I set off last week for Marion Bay, full of expectation, but by the time I arrived, there was a very cool south westerly blowing, scudding clouds and occasional rain. 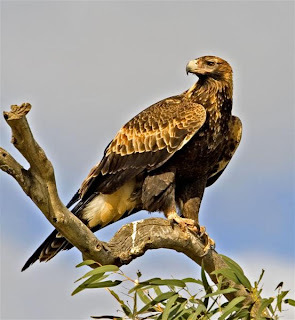 I was still wondering whether I should abort the trip as I drove down the ever deteriorating track towards the car parking area, when I noted a large bird being harasssed by a couple of Forest Ravens, a Wedge-tailed Eagle. Watching the eagle, driving, and getting my camera prepared, all at the same time, made for an interesting few moments. 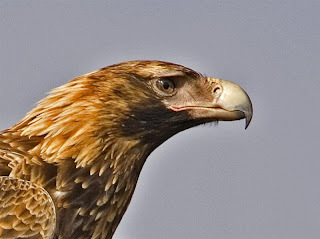 But in no time I was alongside the eagle, now standing in the paddock, keeping a wary eye on me. I guessed it would inevitably take off shortly, and positioned myself upwind and waited. As you can see from the image, I had an excellent view of it as it floated by in the strong wind. 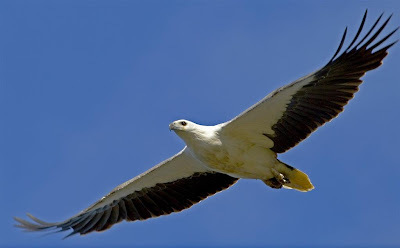 Gaining height, it quickly outflew the ravens, circled and flew along the length of the dune, briefly attacked by two Kelp Gulls. After that, the walk to the point was, inevitably, an anti-climax! Visited Gould's Lagoon this morning, hopeful of getting a few shots of the Clamorous Reed-Warblers or better still, the Little Grassbirds. As I usually do, my first port of call there was the bird hide. (I should just say at this point, that this hide is in a deplorable state. It's obviously used as a drinking venue, smells of urine, and all the signs have graffiti on them, so approach with caution!) Fair number of duck about, mainly Chestnut Teal, but a few Black Duck and Shoveller. I managed a few distant shots of the Reed-Warblers, they appear to be feeding flying young, and a Purple Swamphen. As the water level is pretty low at the moment, I hoped that I might see a Spotless Crake, as those conditions have been fruitful in the past, and I've even managed to photograph them here. But despite waiting in the hide for sometime, no crakes. However, there's al most always plenty going on in the area, and I noted Galahs, Eastern Rosellas, Musk Lorikeets, a single Swift Parrot, Swamp Harriers, Yellow Wattlebirds, several families of Welcome Swallows feeding over the reed beds, to name a few, as I waited. I eventually tired of the wait, and opted instead for a walk down the footpath through the reeds. I stopped several times on this path, just listening for bird calls from the reeds. As I neared the end of the reed bed, I glanced back, just in time to see a crake running rapidly across the track. I was fairly certain it was a Spotless Crake, so I walked back towards where I had see it and waited. It briefly re-emerged, just long enough to confirm my original ID, before dashing back. Wasn't having much luck this morning as far as photography goes, so I re-traced my steps to the hide. 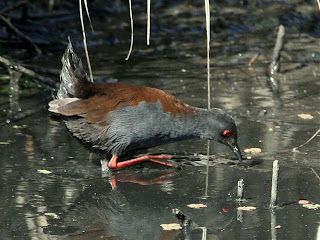 As I walked along the raised walkway, I flushed a crake off the mud, from just a few metres away. 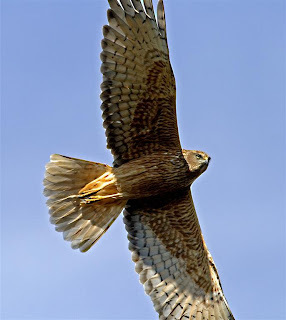 It flew and dropped into the reed bed. Definetly another Spotless Crake. I waited back at the hide, hoping it would come back onto the mud to feed. I couldn't see the area in question from the hide, so I slowly walked back towards the area watching for any sign of movement in the deep shade of the reeds. A flicking tail movement gave away a crake creeping around, and I stood stock still hoping it would emerge. 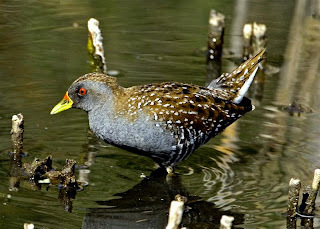 It did, just enough for me to realise that it was in fact a Spotted Crake (now properly called Australian Crake) and not the Spotless that I'd expected. Great Joy! Haven't seen one for possibly 25 years, the last also at this lagoon. I took several 'record' shots, but not what I was after. A passing Harrier caused the local Masked Lapwing to start 'screaming', which in turn caused the crake to seek refuge back among the reeds. Damn! Back to the hide and another wait. Well, as you can see from the images, it finally had a happy outcome. 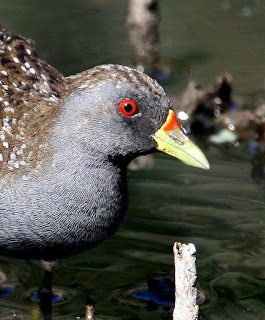 Take 2 saw the Australian Crake feed out away from the reeds, and eventually came quite close to my position. A Spotless Crake also appeared briefly, although noticeably more timid, keeping very close to cover. The 2 crakes fed within half a metre of one another for a time, without seemingly being aware of each others presence. Both species are very 'restless' feeders, constantly on the go, with rapid body movements and the tail held mostly vertical and constantly flicked. Eventually they both walked back into the reeds. For me, it had turned into a memorable morning. It isn't often I get to photograph a 'new' species, and especially one that has such skulking habits. I've spent quite a bit of time in recent days, on the Lauderdale Spit. I guess, like me, most of the local birders think of the spit as mainly a good spot for waders, which of course it is, but there's often more going on here. Lauderdale Spit consists of about, (I'm guessing), less than a hectare of saltmarsh, often substantially covered by seawater on "king tides". There are a few stunted bushes and the odd she oak growing on a bank probably formed when the drainage ditch was dug. It forms part of the Ralph's Bay Conservation Area and is under threat of being turned into, of all things, a housing development! At its base there is a major highway that effectively isolates it. I'm attracted to the area for the relative ease of finding migrant waders, and I've blogged some of my visits. My latest forays there have seen my attempting to photograph some of these waders in flight, not an easy ask at the best of times. No doubt I'll publish those shots sometime. But that brings me back to my point, that there's more to interest birders here than just the waders. While esconced amomg the low vegetation awaiting flybys by the small wader flock, consisting of Bar-tailed Godwit and a lone Whimbrel, I had close encounters with other species. The predominant one at the moment is the White-fronted Chat, (male, top right; female, bottom left), both photographed during my vigil. There appeared to be 3 or 4 pairs of them, and by their reaction to me, are breeding here, and have young in the nest. 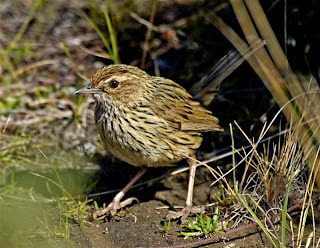 The chats usually nest in the tall spikey clumps of grass, or in low shrubs, and when they feel threatened, flutter down and along the ground, as if injured, to draw your attention from the nest or young. This action appeared to be more likely to be performed by the female. This will, in all probability, be their second, or third attempt at breeding, not all necessarily at this location, for chats are great nomads. Other species that I noted as I lay there, included several Silvereyes, Little Wattlebirds, Yellow-tailed and Brown Thornbills, Starlings and House Sparrows, Goldfinches and Greenfinches. Apart from the passerines, there were Crested Terns, vying for position atop the remnant posts of an old jetty, Pacific, Kelp and Silver Gulls, a lone White-faced Heron and a pair of Chestnut Teal. Two pairs of Pied Oystercatcher nested here, and both appear to have young, one of which took to the water and swam off, when, earlier, I had walked towards the spit end, causing me to beat a hasty retreat. Occasionally, flocks of Pied Oystercatchers, probably moved by the incoming tide or human disturbance, made for the spit end. This sent the resident pairs into a frenzy, running at the interlopers with head down and much calling. This usually moved them on, but occasionally they had to resort to an aerial attack on some of the more stubborn ones. A fascinating place, best visited around high tide, but try to minimise disturbance. 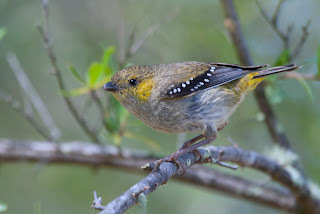 Having spent many hours in the Wielangta Forest on Tasmania's East Coast recently, of course I've seen a lot more than just the Scrubtits and Tasmanian Thornbills that I've recently written about. One of the more noteworthy and quite commonly seen birds, particularly on the narrow tracks, is the Bassian Thrush. As you can see from the shot at left, they're not the easiest bird to spot (or photograph!). At the sort of distance that you usually notice them, they don't look, or indeed act, very differently from their close cousins, the Common Blackbird. The Bassian Thrush is a somewhat more robust bird, and in the hand, you really appreciate that it's a beautifully marked bird. It has over the years suffered something of an identity crisis, having had a number of name changes. I learnt to call it a Ground Thrush, but its also been 'officially' called, Scaly, White's, and Mountain, before finally? settling on its present name of Bassian. I stopped on the track to watch a pair of Brush Bronzewing, one scratching around on the track, the other perched in the nearby scrub. I say a pair with some confidence, as I had just picked up a recently discarded eggshell, almost certainly a bronzewings. Suddenly, from a few feet away, there was a great commotion, startling me for a few moments, as a Bassian Thrush burst from what proved to be its nest, and fluttered down into the low scrub. The nest was basically similar to a Blackbird's, but considerably larger, and 'decorated' on the outside with moss. I have seen other nests over the years, but they had all been on rock shelves, this one was in a fork of a tea tree, a little over head height. I quickly moved on down the track, but returning later, took the accompanying shot of the sitting bird. I don't usually photograph birds at nest sites, but as it sat tight, I couldn't resist the temptation, (at an exposure of 1/15th of a second!). There has been some suggestion that Blackbirds, now commonly seen in similar habitat to the Bassian's, may be having a detrimental effect on them, but the jury is still out on that. 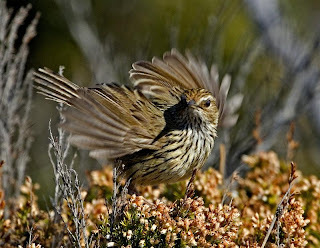 There are two very similar 'brown' thornbills in Tasmania, the Brown and the Tasmanian. I should confess here, that in my early days of birding in Tasmania, without the aid of illustrated bird guides, I rather 'fudged' my sightings of Tasmanian Thornbills. 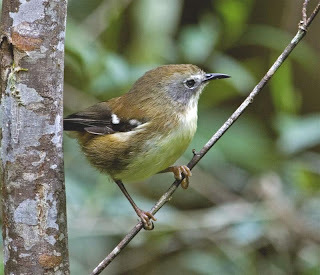 If it was in a wet forest, it must be a "Tasmanian", and vice versa for the "Brown" in drier areas. I must say that in the main, that was probably correct, but these days I'm a little more thorough! I've had a bit of an issue with some of the field guides, largely when the description includes statements like, "bill larger in Brown". This may be true, but unless you have the other to compare it with, or very familiar with both species, it's not the most useful piece of informatio n. I should say here that I'm not setting myself up as an expert on the issue of 'brown' v 'tasmanian'. In fact, while looking through the many images of the 2 species that I've taken, I sometimes got it w rong. The reality in the field is that you're often looking at birds in deep shade or high in the canopy and that's when it gets interesting. 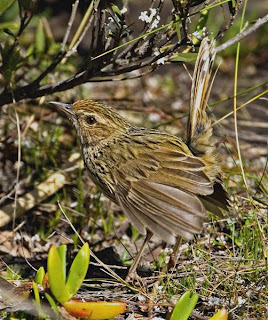 I have published the accompanying images to hopefully aid observers, as there doesn't seem to be many images on the internet of the Tasmanian Thornbill. Many have their own method of differentiating the two, but the rufous colouring on the primaries and pure white undertail feathers (lack of buff), stand out. I hope the images prove useful! I've spent quite a few hours in the Wielangta Forest lately. My prime aim has been to get shots of the Scrubtit, arguably the most difficult of the Tasmanian endemic birds to photograph. It's not that they're uncommon, but they do inhabit the darkest of bird habitats, the fern gullies of wet temperate forests. I've posted here a few of the many shots I've taken, most of which ended up in the "bin". It's the longest time I've ever watched Scrubtits, and it's changed some of my beliefs. Until now, I 've seen them almost exclusively feeding on the vertical trunks of rough barked eucalypts, behaving more like a treecreeper. Perhaps it's because they're breeding at the moment, but most of the feeding has taken place in the understorey scrub, in close proximity of the man ferns in which they appear to have their nests. They feed in much the same way as thornbills, gleaning food off the leaves and only occasionally feeding on the trunks of the same scrub. I've found the Scrubtits to be very timid, probably one of the reasons they're often not found, even in areas known to hold them. A sudden breeze would send them back into the deep scrub, and a calling Olive Whistler entering their domain, sent them into a frenzy approaching apoplexy! In the area that I have been, there appeared to be about five pairs alongside a watercourse, in a distance of 200 metres. I only witnessed the occasional interaction between pairs, initially squaring off, with crown feathers raised, followed by a brief chase, and all over in seconds. A spin off during my vigils, has allowed me to get shots of other species, such as Tasmanian Thornbill, Olive Whistler and the odd Tasmanian Scrubwren, and the enjoyment of watching a Platypus going about its business. I also found an occupied Bassian Thrush nest, complete with sitting adult, and of course, observed other species such as Brush Bronzewing and Satin Flycatcher. I'll probably publish some of these in due course. One thing that has surprised me from the photographs, is that the bill is both longer and more decurved than I realised (despite seeing a large number over the years) and that few of the field guides seem to show this. Overall, I suspect I've never really watched this species critically or intensively before. All too frequently, I've had only a brief sighting, and been glad to have that. Although I've now taken many shots, I'm still looking for that 'defining' image, and will no doubt return to try again.